A Bird scooter awaits its next rider at Colorado Avenue and 5th Street in Santa Monica. The firm ran into legal trouble with the city, which said it failed to secure proper business licenses. (Wally Skalij / Los Angeles Times, "Bird scooter firm settles legal fight with Santa Monica." Bird is a dockless scooter company, modeled after dockless bike sharing. Each ride costs $1 plus 15¢ per minute, which is 5.5x greater than dockless biking, and arguably more expensive than a Jump dockless e-bike. Launched in Santa Monica as proof of concept, Bird has since raised over $100 million in venture capital ("LA-based electric scooter sharing service raises $100m," Financial Times), and like dockless bike share, Segway, various ride hailing ventures, mobility apps, and microtransit projects the firm believes they will be revolutionizing transportation. The problem is such devices fly in the face of the dominant mobility paradigm, which is automobile-centric. Electric scooters, bikes, e-bikes, van pooling, taxis, shared taxis, etc., have been around for awhile, and car sharing since around 2003, although granted advances in IT and telecommunications systems and services make it cheaper to launch wider scale projects now than it did 15 years ago. What is the barrier to entryf or sustainable transportation? The barrier to entry isn't access to bikes (which have been around for more than 100 years) or scooters so much as it is a willingness to use them generally for transportation, and for a majority of trips. At least in the US, large dockless bike systems charge fees per trip that are significantly higher than owning a bike or joining a traditional bike sharing program. Occasional versus regular use | transportational vs. recreational use. I can't see how dockless systems appeal to anyone but the very occasional user, which makes it almost impossible to make money, at least with lots of firms competing in the space. From a sustainable mobility standpoint, arguably, most of the trips aren't transportational, but recreational, which while valuable especially from an exercise and public health standpoint, doesn't have much in the way of substantive impact when it comes to shifting trips from cars to sustainable means. 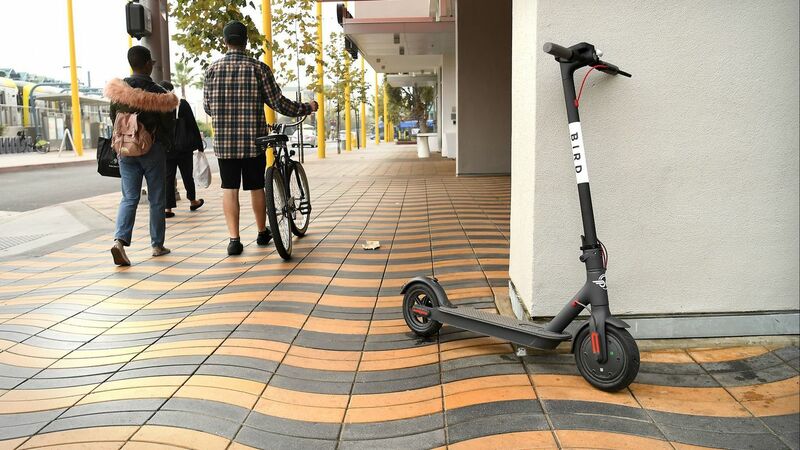 Since it launched in September, Bird’s app-based rental system has become hugely popular in areas of Los Angeles such as Santa Monica and Venice, where hundreds of scooters are available on the street for anyone to pick up and drop off. Hire of the scooters, which resemble the Razor and Micro kick scooters popular with children but have an electric motor that can go up to 15mph, is charged by the minute, with the devices tracked by GPS. More than half a million rides on Bird were taken in the past 30 days, the company says, doubling over the previous month. “We believe Bird is writing the next chapter in transportation and is poised to become the next great company in this space,” said Antonio Gracias of Chicago-based Valor, who also sits on the boards of Tesla and SpaceX. "In/appropriate technology," a combination of technology and cost to use it. Although I think like with the promotion of electric bikes in the cores of center cities--often an e-bike is overkill in this situation ("(Still) tired of mis-understanding of the potential for e-bikes," 2015)--an electric scooter is probably overkill for short distances, and less likely to be used for long distances. Business failures as opportunities to learn. Given experiences with Juicero ("Juicero is shutting down," The Verge), Split ("D.C.-based ride-sharing service Split ends operations," Washington Business Journal), Kozmo ("Kozmo to End Operations; 1,100 People to Lose Jobs," New York Times), or Bridj ("Bridj, local on-demand bus service, is shutting down," Boston Globe), I'd be leery of putting my money into Bird. It's an example of people not knowing much about transportation and logistics thinking that putting a bunch of bikes or scooters out there will transform how people get around while investing very little in assisting people with the transition, let alone evaluating whether or not the particular method is a good way for getting around to begin with. 1. Expectations were too high. The Segway was described as the future of transport. As an innovation it was said to be on a par with the PC or the internet. Inevitably it could not live up to this level of hype. PR exposure is generally useful but this time it was overdone. 2. It was a product not a solution. The product works well but it lacked a support context. Where can you park it? How do you charge it? Do you use it on roads or sidewalks? Our cities are designed for pedestrians or speedy vehicles and this was neither so it had no proper infrastructure to support it. 3. No clear need or target market. Who was the target market? Who really needed this? It was an appealing novelty but there was no compelling need for anyone to buy it – and it was very expensive. 4. It was an invention rather than an innovation. The Segway was patented and kept under wraps until its launch. There was no user feedback or iteration in the process. Its inventors were then surprised when people criticised or ridiculed the design for being ‘dorky’ rather than cool. 5. Regulation. The Segway fell foul of regulation in many countries where it was banned from sidewalks and roads because it did not fit any existing categories. This is a problem for a truly revolutionary product – but it was not properly anticipated. Also see "WELL, THAT DIDN'T WORK: THE SEGWAY IS A TECHNOLOGICAL MARVEL. TOO BAD IT DOESN'T MAKE ANY SENSE," Wired. Note that I don't mean to say that an e-scooter sharing system or dockless biking is an exact analogue of Segway and the way it was conceptualized and launched, but that these attempts to innovate need to be studied for clues going forward for other types of innovation. How to increase the adoption of sustainable mobility. Automobility is the dominant mobility paradigm in the US, even in most US cities (with a few exceptions). The biggest stumbling block for sustainable mobility modes is the dominance of the automobility paradigm. Most of the firms seem to be more a venture capital play, and not a mobility play. More attention will need to be paid to the research in travel behavior and the choices people make, with an aim of creating "product service systems" which address barriers to change. What I call the sustainable mobility platform isn't just the services, but also the programming necessary to assist people in the adoption and regular use of mode alternatives to the automobile. How to push sustainable mobility forward. Failure of mopeds in the US. Speaking of "appropriate technology" in the urban context, a moped--popular in cities in Europe, especially Italy, and Asia--makes a lot of sense in Southern and Western states, but after 40 years such vehicles have made little headway towards adoption. While mopeds are not environmentally friendly, efforts are underway to electrify them. There is a fascinating 1977 article in People Magazine ("Ever Wonder How a Fad Starts? In the Case of Mopeds, Look to a Silver-Tongued Frenchman") discussing the process to make mopeds legal in the US, to develop distribution systems, etc. That being said, distribution and dealership systems along with enabling laws and regulatory system have been created, but 40 years later, the moped remains an insignificant element of the US mobility mix. It's a cautionary note. Car sharing and ride hailing are popular because they involve car use, and car trips are still preferred by a majority of the population. While bike share, biking, and transit still experiences relatively low use, except in those situations especially in legacy cities where urban design, density, and other factors make these modes particularly efficient. A study in Beijing ("Factors influencing the choice of shared bicycles and shared electric bikes in Beijing," Transportation Research Part C: Emerging Technologies, Volume 67, June 2016, Pages 399-414) found that there, e-bikes took mode share from cars, whereas so far in North America bike sharing primarily takes mode share from transit. Given the dominance of the automobile in the US planning regime, only a mix of push (regulations, fees, etc.) and pull (incentives) measures will bring about substantive shifts to sustainable modes. The US experience shows that incentives aren't enough and neither is "providing people with more choices." When people have a choice, they generally pick the automobile. Thats not a moped its a scooter. I don't understand your point. I wasn't claiming otherwise. Why wouldn't the success or failure of successful widespread adoption of "new" transportation technologies that are alternatives to the car, such as a moped, be relevant to evaluating the opportunity for success or failure wrt electric scooters? One advantage of the scooter is it's cheaper. One disadvantage is that a moped is much more likely to be used for trips of short and longer distances, it's possible for two people to ride a moped, etc. 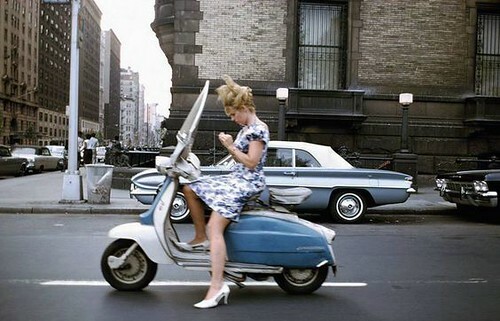 Well the photo caption with the lady @Central Park West says its a moped. It is not. A moped is basically a motorized bicycle and has pedals that can be pedaled like a bike, although they rarely are. The picture is of a scooter, or a motor scooter, such as a Vespa. The point is they are different, like a car is different from a truck, a bicycle is different from a tricycle, and a bus is different from a van. That's all. Today's e-bike is probably most similar to yesterday's moped. Argh. So I am wrong. You're saying a Vespa is a scooter, and familially related to the simple e-scooters being used Bird. Design wise they seem to be becoming congruent. But the definition is that a scooter is fully propelled while a moped expects the driver/rider to pedal at least part of the time. Basically, I used the term wrong. I corrected the caption. In any case, the point about aiming to "diffuse" mopeds or scooters like the Vespa as a cautionary tale is still relevant.